Bushehr is a city beside the Persian Gulf. In 1996 I had been teaching a class in photography for the Youth Association for Cinema. One of my students invited me and another photographer to visit the city Bushehr where he lived. He gave us a tour of the city. One of the interesting areas of Buschehr was its port area and the fish market. When I was walking along a tiny street in the fish market I saw this picture that I found interesting. I noticed the writing on the door both in English and Persian saying welcome and small store. 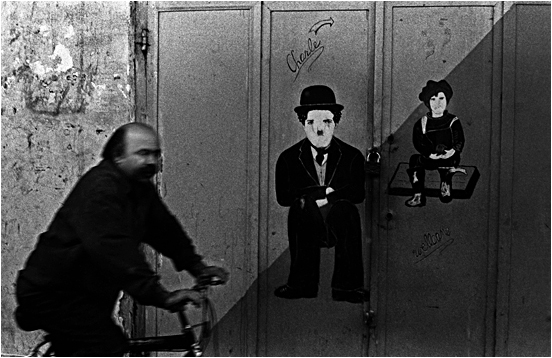 When I saw the man with a moustache riding his bicycle down the street I took this photograph, a perfect complement to the message on the door and the Charlie Chaplin picture. Posted on March 31, 2011 by PHOTOFADE. This entry was tagged Bicycle, Bushehr, Charle, Charlie Chaplin, Iran, Man, Moustache, Persian Gulf, Riding, welcome. Bookmark the permalink. In my opinion when this picture was made people lived without fredoom. Two people, sitting and waiting could bimbolize the patience and also the hope. Hope, because of the word: WELCOME. This word offers the posibility to reach out hands and to open their mainds. For the painters perhaps meant to express their opinon, their dreams so that they could share with other people. A simple picture while strong.